The energy was overwhelming; the colors, breathtaking with people hustling and bustling. The winter sun failed to seem bright enough amidst the thousand gleaming faces, yet the trees seemed to arc proudly above this influx of literary enthusiasm and cultural magnificence. I stood there – shaken, but more awakened trying helplessly to take in the enormity and magnanimity of this great celebration of both readers and writers. Helpless, is the last thing I should have been. Books are a large part of my world, authors are my inspiration and fellow readers my greatest companions. But at first glance, this literary extravaganza was a sight difficult to swallow and almost unnerving, yet as time passed I felt less like a migrant and more like a native. Soon I found myself in my element, with a swing in my walk and added flavour in my talk. 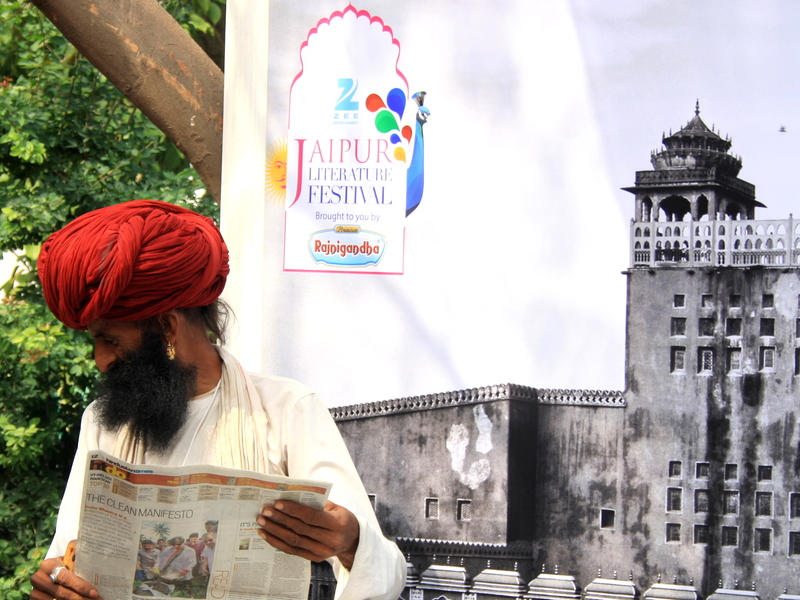 The Jaipur Literature Festival felt like it was my own, as though I belonged there. While my heart was content and at peace, a deep sense of regret crept in- regret at never having been here before. There comes a moment in all our lives when we wish we could cut ourselves into half, and be in two places at the same time. I faced a similar dilemma here, but mine was more grave. It involved a desire to be in six places at the same time. The Diggi Palace in India’s Pink City has the unfathomable capacity to have six distinct, spatially segregated and entirely unique locations where sessions take place simultaneously. Each one of these has authors, intellectuals, journalists and academicians dissipating knowledge, each better than the other. No matter how clear headed you are, no matter how well you make your decisions in life, making this decision can get the best of the best nto a tight spot. A typical Litfest morning is undoubtedly characterised by a stream of ardent literature enthusiasts sitting pensively along the rugged fountain of the Diggi Palace with the elaborate program schedule in hand, calling the shots for which sessions to attend (always sadistically hoping the one they’re missing out on turns out to be a failure). Once this decision is made, the day begins and unleashes along with it experiences that will never leave your heart and make you smile whenever reminisced. The turnout this year increased by leaps and bounds as several popular names such as Chetan Bhagat, Narayana Murthy, Rajdeep Sardesai, Javed Akhtar, Naseeruddin Shah and Shobhaa De, just to name a few, were present. Sonam Kapoor launching Anupama Chopra’s new book on a Sunday in the city, as presumed attracted a large number of Jaipur locals necessitating additional police protection. It is this, that is the true essence of the festival – for everyone to find their own comfort space, interest and passion; and for those who may not already have that, to create it. As the largest free literature festival on Earth, the success of this 5 day treat is testimony to the sheer genius of the founders, brilliance of the organisers and hard work of the volunteers. It unflinchingly defies all notions that in India no free service can ever keep it’s ideological significance intact. A decade old initiative now, it’s strength and popularity is only soaring each year as it continues to be an epicentre of cross-cultural interaction and ever increasing literary passion.